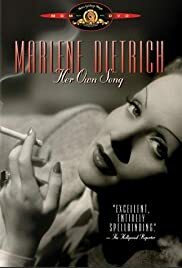 This documentary, made by her grandson, focuses on the fabulous Marlene Dietrich's contributions during World War II and the way she was viewed by Germans and the rest of the world due to her activities during that time. These include her becoming an American citizen and entertaining American soldiers despite German efforts to get her back in Berlin and supportive of her own country's war efforts. According to Maria Riva's fascinating biography of her mother, one of Dietrich's main reasons for going overseas as a performer during the war was to reunite with her lover, French film star Jean Gabin. However, it's apparent that the artist soon fell in love with the soldiers and became much more than part of a traveling show. She donned fatigues, she sat and talked with them, flirted with them, sang with them, and visited them in hospitals. For the rest of her life, veterans were known to her as "my boys" when they flocked to see her in Las Vegas, Israel, or wherever she performed. Her experience was summed up in an antiwar song that was part of her concerts, "Where Have All The Flowers Gone?" The documentary goes into Dietrich's early career in Berlin and just touches on her Hollywood success. There are interviews with her daughter, friends, and historians throughout, and the documentary is peppered with home movies, interview footage, and performances. It's a much less cynical look at Dietrich than is found in Riva's book, where, for instance, she describes her mother telling everyone at one point that she was going to Germany to get her sister out of Bergen-Belson, failing to mention that it was the town of Bergen-Belsen and not the concentration camp. The documentary also stays out of most of Dietrich's personal life, which is covered in great detail in her biography. It would all be superfluous here. This is the story of a great icon, her roots, and how the watershed experience of World War II changed her art.